We lost Harry tonight. In the backseat of the car on the way to pet emergency. In the arms of our friend who’s been staying with us this week. Harry would have been 13 tomorrow. We don’t understand why he died suddenly. We’d been treating him for lymphoma but then had to postpone his treatment earlier this week because his platelet count was too low. A concern, yes, but all other indications were he was doing well. Even as recently as today on his walk with Happy Wife, and later his appetite and spirit, he seemed fine. And then suddenly around 7 pm he came inside the house appearing very bloated, nothing too unusual for him lately, but this time exhibiting a kind of halting, gasping breath, and he was foaming at the mouth. Something was clearly different, not right. Happy Wife quickly took him outside for a short walk, which has helped him degas in the past. Only this time it didn’t help. I called for calm in the garage, thinking — hoping really — he’d recover. But it was the wrong call. We all piled in the car. We were only blocks from the hospital when I turned to look at our friend who was in the backseat with Harry. The shake of the head. The consoling hand on my shoulder. Happy Wife flooded in tears. How to describe Harry. 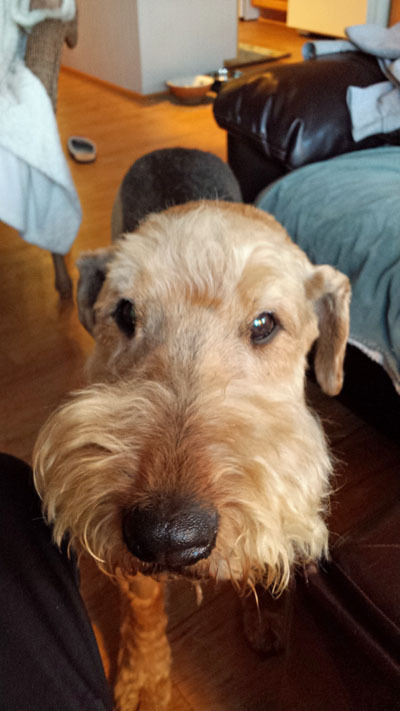 Probably the sweetest, gentlest, funniest Airedale we’ve ever had the good fortune to companion ourselves with. I think that about captures it; that was Harry. We will miss him very much. Happy 13th Birthday and Godspeed you crazy Jughead, Godspeed. Ohhh..we’re so sorry Rod & Nancy…while talking yesterday on the phone to Nancy Harry was in the yard eating dirt which turned out to be a cookie! We share your sadness. Nancy & Rod, I am so very sorry to hear about Harry. I was just asking Nancy about him earlier this week. Here’s sending you all my prayers. Thank you all. Your thoughts mean a lot to us.